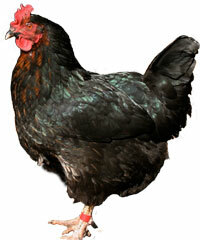 Home » Poultry News » U.K. Poultry News » Black Rock Chickens are Saved! Black Rock hybrid chickens are hardy, productive hens that lay up to 280 eggs a year and have been a very popular choice for both smallholders and backyard poultry keepers. Black Rock hens are bred by crossing two very unique strains of Rhode Island Red cockerels with Barred Plymouth Rock hens which have until now come from the Muirfield hatchery in Scotland. For 40 years, Peter and Margaret Siddons have looked after and improved these strains and have distributed day old chicks all over the UK to distributors who have grown and sold them from this age to point of lay. Peter and Margaret have now retired and have moved from Muirfield. At one point, it was thought that the Black Rock bloodlines would be lost forever but fortunately Eddie Lovett and his son Calum at Crosslee Poultry Farm (also in Scotland) have taken over the Black Rock bloodlines. Crosslee will continue to supply the Black Rock hybrid. Numbers are limited this year but Eddie expects to be able to meet the full demand for the Black Rock by Spring of next year. If you knew Peter and Margaret Siddons of Muirfield and would like to send them good wishes in their new home, you can send cards to 23 Curate Wynd, Kinross, KY13 7DX. You can also call Peter Siddons on 01577 863617 who would love to hear from some of his old customers.